This article is about the baseball catcher and manager. For the utility player, see Bruce Bochte. Bruce Douglas Bochy (/ˈboʊtʃi/; born April 16, 1955), is the manager of the Major League Baseball (MLB) San Francisco Giants. During his playing career, Bochy was a catcher for the Houston Astros, New York Mets, and San Diego Padres. Prior to becoming the Giants’ skipper, in 2007, he was the Padres’ manager for twelve seasons. 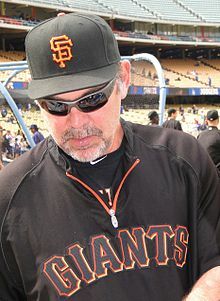 Bochy has led the Giants to three World Series Championships, and previously led the Padres to one World Series appearance. Bochy is one of just eight Major Leaguers to be born in France (in Bussac-Forêt, Charente-Maritime), where his father, Sgt. Major Gus Bochy, was stationed as a U.S. Army NCO at the time. Growing up, Bochy moved with his family to the Panama Canal Zone, South Carolina, northern Virginia, and ultimately Melbourne, Florida. Bochy graduated from Melbourne High School, where he was a baseball teammate of Darrell Hammond of Saturday Night Live fame. He was drafted by the Chicago White Sox in the 8th round of the 1975 amateur draft but did not sign. He attended Brevard Community College (later known as Eastern Florida State College) for two years on a partial scholarship, winning a state championship in 1975, before committing to play baseball for Eddie Stanky at South Alabama, but he decided to turn pro when he was drafted in the first round (24th overall) by the Houston Astros in the 1975 Supplemental Draft. As a catcher, Bochy played with the Houston Astros (1978–80), New York Mets (1982) and San Diego Padres (1983–87). In 802 career at-bats, he hit .239 with 26 home runs. With the Astros, he primarily backed up Alan Ashby. Bochy was traded to the Mets on February 11, 1981, for two minor leaguers. Two years later, he was released by the Mets and signed with the Padres as a free agent. With the Padres, he was the backup to Terry Kennedy from 1983–86 and rookie catcher Benito Santiago in 1987. In 1988, Bochy spent his final season playing in Triple-A Las Vegas where he served as a player-coach, batting .231 in 53 games. With the Astros, Bochy was behind the plate in Game 4 of the 1980 NLCS versus the Philadelphia Phillies when Pete Rose ran over Bochy to score the go-ahead run in the top of the tenth inning. Bochy was the backup to Terry Kennedy when the Padres won their first NL pennant in 1984, and he played in one game in the 1984 World Series, which the Padres lost in five games to the Detroit Tigers. On July 1, 1985, Bochy hit a tenth-inning walk-off home run off Nolan Ryan of the Houston Astros, the only walk-off home run allowed in Ryan's career. Bochy was behind the plate on September 11, 1985, when Pete Rose, now with the Cincinnati Reds, collected his record-breaking 4,192nd major league hit off Padres pitcher Eric Show. After retiring as a player, Bochy was hired by Padres general manager Jack McKeon to manage in their minor league system. He started the 1989 season assisting the Class-A Riverside Red Wave before leaving to manage the Short-Season Class-A Spokane Indians, leading them to their third consecutive championship. In 1990, Bochy took over as manager of the Red Wave, finishing with a 64–78 record. In 1991, Bochy followed the team to Adelanto, California, where they became the High Desert Mavericks, and led them to a 73–63 record and California League title. In 1992, Bochy was promoted to manager of the Double-A Wichita Wranglers, leading them to the Texas League title that year. After four years of managing for their minor league teams, the San Diego Padres picked Bochy to be the team's third-base coach under new manager Jim Riggleman in 1993. Following the departure of Riggleman after the 1994 season, the Padres named Bochy as their new manager for the 1995 season. At age 39, Bochy became the youngest manager in the National League and helped the Padres improve from 47–70 in 1994 to 70–74 in his rookie year. In 1996, his second season, Bochy led the Padres to a 91–71 record and their second National League West division title in franchise history, earning Bochy National League Manager of the Year and Sporting News National League Manager of the Year honors. In 1998, Bochy led the Padres to a franchise-best 98–64 record and the second National League pennant in Padres history, earning Sporting News Manager of the Year honors for the second time. The Padres were swept in four games in the 1998 World Series by the New York Yankees. After the World Series, the Padres dramatically cut payroll and suffered five straight losing seasons. In 2005 and 2006, Bochy led the Padres to consecutive NL West titles for the first time in franchise history, but they lost to the St. Louis Cardinals in the Division Series each year. Reliever Trevor Hoffman saved 457 games managed by Bochy, the most saves by one pitcher under one manager in Major League history, according to NBC Sports Bay Area. After the 2006 season, new Padres CEO Sandy Alderson preferred to have a younger manager, so he allowed Giants General Manager Brian Sabean to interview Bochy for his job opening. Bochy left the Padres for the Giants after the 2006 season. He finished his Padres career with a regular season record of 951–975 and a post–season record of 8–16. Bochy has the most games managed in Padres history and with that, the most wins and losses. In 12 seasons under Bochy, the Padres had five winning seasons and won four NL West titles and one NL pennant. While with the Padres, Bochy also managed the 2004 and 2006 MLB All-Stars in the Major League Baseball Japan All-Star Series. Bochy agreed to a three-year contract to replace Felipe Alou and become the Giants' new skipper on October 27, 2006. After two seasons of 90+ losses in 2007 and 2008, the Giants rebounded to finish 88–74 in 2009, and remained in the playoff race into September behind a pitching staff with the second-lowest ERA in the Majors. After the season, Bochy received a new two-year contract with an option for 2012. In 2010, the Giants finished 92–70 and clinched their first NL West title since 2003 on the final day of the regular season against the Padres. Underdogs throughout the postseason, Bochy's "bunch of castoffs and misfits" defeated the Atlanta Braves in the 2010 NLDS and the reigning 2-time National League champion (who had won a World Series during that stretch) Philadelphia Phillies in the NLCS. The Giants defeated the Texas Rangers in five games in the 2010 World Series, bringing the first World Series Championship to San Francisco and the Giants' first title since 1954 when the team was based in New York City. Following the season, the Giants exercised Bochy's 2012 contract option. In 2011, the Giants finished 86–76 and missed the playoffs. After the season, the Giants extended Bochy's contract through 2013, with an option for 2014. In 2012, the Giants clinched the NL West for the second time in three years against the Padres, finishing with a 94–68 record. In the postseason, the Giants fell behind the Cincinnati Reds 0–2 in the 2012 NLDS before winning three straight games to stave off elimination. In the NLCS, the Giants fell behind the St. Louis Cardinals three games to one, but again won three straight elimination games to clinch their second National League pennant in three seasons. The Giants swept the 2012 World Series against the Detroit Tigers in four games. After the season, Bochy said the tagline for 2012 was "never say die". Before the 2013 season, the Giants extended Bochy's contract through 2016. Bochy became the 21st manager with 1,500 wins on July 23, 2013. The Giants finished the season 76–86 and missed the playoffs in 2013. When Jim Leyland retired after the 2013 season, Bochy became MLB's active leader in wins with 1,530. In 2014, Bochy became the 19th manager to reach 1,600 wins on August 27, and also became the all-time NL Western Division leader in managerial wins, passing Los Angeles Dodgers manager Tommy Lasorda for that distinction, since the installment of division play in 1969. With an 88–74 record, the Giants made the 2014 postseason as the second wild-card team. During a low point of the regular season, Bochy told his players they had "champion blood", referring to the Giants' 2010 and 2012 championships. After defeating the Pittsburgh Pirates in the NL Wild Card Game, the Giants beat the heavily favored Washington Nationals three games to one in the NLDS and the St. Louis Cardinals four games to one in the NLCS for their third NL pennant in five years. Bochy's "group of warriors" went on to defeat the Kansas City Royals to win the 2014 World Series, a series that went the full seven games. 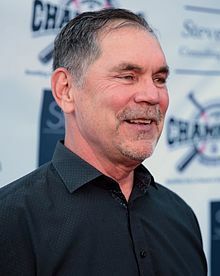 Bochy became the tenth manager in MLB history to win three championships, with the previous nine all inducted into the Hall of Fame. [note 1] However, some experts believe Bochy's postseason success is merely coincidental considering his lack of consistent regular-season success with a high-payroll team. On April 3, 2015, the Giants announced Bochy had signed a contract extension through the 2019 season. On June 10, 2015, Bochy recorded his 700th win as Giants manager, making him the fourth in history to win at least 700 games for two different teams, joining Sparky Anderson, Tony La Russa, and Jim Leyland. The milestone came on the same night that Chris Heston threw a no-hitter for the Giants, the fifth no-hitter by the Giants under Bochy (Jonathan Sánchez in 2009; Matt Cain's perfect game in 2012; and Tim Lincecum in 2013 and 2014). On September 27, 2015, Bochy became the 16th manager to record 1,700 wins. The Giants finished with an 84–78 record and missed the playoffs in 2015. On June 26, 2016, Bochy recorded his 800th win as Giants manager. On June 30, Bochy became the first manager since 1976 to intentionally forfeit the designated hitter, allowing Madison Bumgarner to bat for himself against the Oakland Athletics. With an 87–75 record, the Giants made the 2016 postseason as the second wild-card team, clinching on the final day of the regular season. The Giants defeated the New York Mets 3–0 in the NL Wild Card Game, their 11th straight postseason series win, dating back to 2010. The Giants lost the 2016 NLDS in four games to the Chicago Cubs, their first postseason series loss under Bochy. On April 9, 2017, at Petco Park, in a 5–3 win over the San Diego Padres, Bochy tied Dusty Baker with his 840th career managerial win for the Giants in the San Francisco Era. The next day, in the Giants' home opener at AT&T Park and a 4–1 win over the Arizona Diamondbacks, Bochy surpassed Baker to become the all-time San Francisco Giants managerial wins leader. On May 3, 2017, Bochy became the 15th manager to reach 1,800 wins. On September 25 at Chase Field, in a 9–2 win over the Arizona Diamondbacks, Bochy won his 900th career game as manager of the San Francisco Giants, making him the first manager in Major League history to win 900 games with two different teams. Expected to be postseason contenders in 2017, the Giants instead fell to 64–98, matching Bochy's worst record as a manager,[note 2] and the Giants' worst since 1985. On July 29, 2018, Bochy recorded his 1,906th career victory as manager, surpassing Casey Stengel into 11th place on MLB's career wins list. Numerous injuries and an underperforming offense resulted in the Giants finishing 73–89 in 2018. With Mike Scioscia stepping down as the Los Angeles Angels manager on the last day of the 2018 MLB season, Bochy enters the 2019 season as the longest-tenured manager in Major League Baseball. On February 18, 2019, Bochy announced he will retire following the conclusion of the 2019 season. Bochy is the third of four children. His older brother Joe was a onetime catcher in the Minnesota Twins system and later worked as a professional scout for the Padres and Giants. Bochy met his wife, Kim Seib, while at Brevard Community College in 1975 and they married in 1978. They reside in Poway, California and have two sons, Greg and Brett. Greg Bochy spent several seasons playing minor league baseball in the San Diego Padres system. Bochy's younger son, Brett Bochy, was drafted by the Giants in 2010. Brett was called up to the majors on September 2, 2014, making Bruce the seventh manager in MLB history to manage his own son. On September 13, 2014, Bruce became the first manager to give the ball to his son coming out of the bullpen. Bochy is known for having one of the largest cap sizes in Major League Baseball. With Houston, his nickname was "Headly," due to his unusually large head, with a hat size measurement of 8​1⁄8. When he joined the Mets in 1982, they did not have a helmet that would fit him, and they had to send for the ones he was using in the minors. On February 19, 2015, Bochy underwent angioplasty to have two stents inserted in a blood vessel that was 90 percent blocked. On August 8, 2016, Bochy was hospitalized overnight for an irregular heartbeat and underwent a cardioversion procedure, missing one game. On April 18, 2017, Bochy underwent a minor heart ablation to reduce discomfort, mostly due to an atrial flutter, and missed two games. After the 2017 season, Bochy underwent another ablation procedure to treat an atrial fibrillation. In May 2011, Bochy won the Ronald L. Jensen Award for Lifetime Achievement, which he accepted at Positive Coaching Alliance's National Youth Sports Awards. In 2011, the baseball field at Brevard Community College was named Bruce Bochy Field in his honor. In 2015, Bochy released A Book of Walks (ISBN 978-0985419035), describing his favorite walks around San Francisco and other major league cities. Bochy has rated Johnny Bench as the first choice on "His Top Five Catchers, All-Time" list, with the following in descending order: Carlton Fisk, Yogi Berra, Thurman Munson, and Iván Rodríguez. The editors of the Sporting News, ed. (1992). Baseball A Doubleheader Collection of Facts, Feats, & Firsts. St. Louis, Mo. : The Sporting News Publishing Co. ISBN 0-88365-785-6. .
^ The 2003 San Diego Padres also finished 64–98. ^ a b c d e Schulman, Henry (March 11, 2007). "MEET BRUCE BOCHY / NEW HEAD MAN / San Francisco's 16th manager owns reputation to match his cap size Former Army brat keeps a low profile, and players love it". San Francisco Chronicle. ^ Baggarly, Andrew (October 29, 2006). "Bochy doesn't like wasting outs, abusing arms". ^ Rosecrans, C. Trent (September 20, 2012). "The Lineup: Ichiro of old shows up in Bronx, C.J. Wilson comes up small". CBSSports.com. ^ Bulwa, Demian (October 15, 2010). "S.F. Giants' Bruce Bochy has humble approach". San Francisco Chronicle. ^ Kerasotis, Peter (January 15, 2011). "Peter Kerasotis: Titans give Bochy giant homecoming". Florida Today. ^ "#289 Bruce Bochy". 1980 Topps Baseball Card Project. May 29, 2010. ^ a b Fitzpatrick, Frank (October 14, 2010). "Giants' manager part of Phillies lore". Philadelphia Inquirer. ^ a b Friend, Tom (July 2, 1985). "Padres Beat Astros in 10 Innings, 6-5, on Bochy's Homer : Reserve Catcher Hits His Third Home Run of Season Against Former Teammate Ryan". Los Angeles Times. ^ Haft, Chris and Adam Berry (June 26, 2011). "Bochy reveres skippers McKeon, Johnson". MLB.com. ^ Distel, Dave (March 21, 1985). "Spring Training / Padres : Backing Up Kennedy Is a Role Bochy Accepts". Los Angeles Times. ^ a b c Shea, John (September 29, 2014). "Bochy carving out quite a career". San Francisco Chronicle. ^ "Nolan Ryan Career Home Runs Allowed". baseball-reference.com. ^ Friend, Tom (September 11, 2010). "The tortured life of Eric Show". ESPN.com. ^ a b Alexander, Jim (April 13, 2013). "BOCHY: Managing Red Wave was a challenge, learning experience". The Press-Enterprise. ^ Seminoff, Kirk (November 7, 2010). "Once, twice, three times a champion". The Wichita Eagle. ^ "Bochy to Be Third Base Coach for Padres". Los Angeles Times. November 13, 1992. ^ AP. "Bochy Named Padre Manager After Riggleman Jumps To Cubs". The Seattle Times. Retrieved 15 October 2014. ^ a b "Nod To Ex-Indians Skipper". The Sporting News. The Spokesman-Review. October 8, 1996. ^ Newhan, Ross (June 16, 1998). "Still Waters: They Run Deep in San Diego, Where Manager Bruce Bochy Is at the Center but Far From the Front of Veteran Padres". Los Angeles Times. ^ a b "Giants hire two-time Manager-of-the-Year Bruce Bochy as manager". MLB.com. October 27, 2006. ^ Wilson, Bernie (February 17, 2004). "Padres add a year to Bochy's deal". The Associated Press. USA Today. ^ Krasovic, Tom (May 30, 2014). "Bochy an NL West title mainstay for Padres". San Diego Union-Tribune. ^ Bloom, Barry M. (October 24, 2010). "Bochy follows familiar path to Series". MLB.com. ^ "Bochy looks forward to challenge of managing Giants". ESPN. Associated Press. October 29, 2006. Retrieved December 21, 2014. ^ a b "Bruce Bochy". Baseball Reference. Sports Reference LLC. Retrieved December 21, 2014. ^ a b Shea, John (March 5, 2010). "Bochy has a sense of security in 2010". San Francisco Chronicle. ^ "Jonathan Sanchez eliminates Padres to give Giants NL West title". The Associated Press. ESPN.com. October 3, 2010. ^ Matuszewski, Erik (October 23, 2010). "Giants 'Misfits' Beat Phillies to Win NLCS, Reach World Series". Bloomberg. ^ Stark, Jayson (October 24, 2010). "Giant cast of 'misfits' marches on". ESPN.com. ^ Slusser, Susan (November 2, 2010). "SF Giants are champs, dashing Bochy's butterflies". San Francisco Chronicle. ^ a b "Giants' statement on Bochy, Sabean" (Press release). San Francisco Chronicle. February 4, 2011. ^ Schulman, Henry (September 29, 2011). "Giants' chances ended with Buster Posey's injury". San Francisco Chronicle. ^ Haft, Chris (November 30, 2011). "Giants extend Sabean, Bochy through 2013". MLB.com. ^ Schulman, Henry (September 23, 2012). "Giants clinch NL West title". San Francisco Chronicle. ^ Kroner, Steve (October 13, 2012). "Giants, Cards' tough off-field comebacks". ^ Schulman, Henry (October 22, 2012). "San Francisco Giants crush Cardinals to win the NL pennant". San Francisco Chronicle. ^ Schulman, Henry (October 28, 2012). "SF Giants win World Series". San Francisco Chronicle. ^ "Giants celebrate with victory parade". The Associated Press. ESPN.com. October 31, 2012. ^ Kroichick, Ron (March 28, 2013). "Giants reward Sabean and Bochy with contract extensions". San Francisco Chronicle. ^ Pavlovic, Alex (July 24, 2013). "Bochy reaches next level as Giants get unique win". San Jose Mercury News. ^ Schulman, Henry (February 14, 2014). "5 questions facing the Giants heading into the 2014 season". San Francisco Chronicle. ^ Novy-Williams, Eben (October 21, 2013). "Leyland Retires as Manager of MLB's Tigers After Eight Seasons". Bloomberg. ^ Haft, Chris (August 28, 2014). "Posey's walk-off keeps Giants in Wild Card control". MLB.com. ^ Baxter, Kevin (August 16, 2014). "No-nonsense approach is a winner for Giants Manager Bruce Bochy". Los Angeles Times. ^ Berman, Steve (September 26, 2014). "Pence's "(expletive) champion blood" speech gets Giants ready for postseason (video)". Bay Area Sports Guy. ^ "Forecast: Predicting the postseason". ESPN.com. October 1, 2014. Archived from the original on October 2, 2014. ^ Spencer, Lyle (October 17, 2014). "Bochy trusts instincts, pushes right buttons". MLB.com. ^ Brown, Daniel (October 10, 2014). "Captain Calm: Giants' Bruce Bochy sets even tone". San Jose Mercury News. ^ Jenkins, Bruce (October 30, 2014). "Jenkins: Savor it, the Giants are world champions again". San Francisco Chronicle. ^ Killion, Ann (November 1, 2014). "With 3 titles, close enough to a dynasty". San Francisco Chronicle. ^ Pavlovic, Alex (November 2, 2014). "With third title, Bochy joins club that only includes Hall of Famers". San Jose Mercury News. ^ "Bruce Bochy Has the Postseason Touch With Giants". The Associated Press. The New York Times. October 18, 2014. ^ Keri, Jonah (October 9, 2014). "Is Bruce Bochy One of the Best Managers in Baseball History? (Yes. Here's Why.)". Grantland. ^ McPherson, Sam (October 6, 2016). "NLDS Tale of the Tape: Chicago Cubs Vs San Francisco Giants". CBS Chicago. ^ Haft, Chris (April 3, 2015). "Bochy, Sabean extend contracts; GM moves up". MLB.com. ^ Baggarly, Andrew (June 10, 2015). "Chris Heston on his no-hitter: "I still can't believe it happened"". San Jose Mercury News. ^ Lemire, Joe (June 10, 2015). "Old hat for Giants: Chris Heston tosses no-hitter". USA TODAY. ^ Wulf, Steve (July 3, 2015). "No bluffing: How Bruce Bochy became baseball's best manager". ESPN.com. ^ Shea, John (October 4, 2015). "Giants lose to Rockies in emotional finale". San Francisco Chronicle. ^ Haft, Chris; Zolecki, Todd (June 26, 2016). "Giants walk off for NL-best 49th victory". MLB.com. ^ Baggarly, Andrew (June 29, 2016). "BREAKING: Giants to give up DH, let Bumgarner hit in Oakland". Bay Area News Group. ^ Slusser, Susan (June 30, 2016). "Madison Bumgarner is a hit in all ways in Giants' win over A's". San Francisco Chronicle. ^ Schulman, Henry (October 2, 2016). "Giants playoff-bound after completing sweep of Dodgers". San Francisco Chronicle. ^ "Giants tie MLB record for most consecutive postseason series wins". CSN Bay Area. October 5, 2016. ^ Anderson, R.J. (October 12, 2016). "Cubs-Giants Game 4: Final score, things to know as Cubs advance to NLCS after furious comeback". CBSSports.com. ^ Pavlovic, Alex (May 3, 2017). "Instant Replay: Giants Win Series Over Dodgers in Extra Innings". NBC Sports Bay Area. ^ Sharkey-Gotlieb, Simon (September 2017). "Bochy becomes 1st manager ever to win 900 games with 2 teams". theScore.com. Retrieved February 19, 2019. ^ Pavlovic, Alex (September 28, 2017). "Bochy on future: This is 'certainly not the way I want to go out'". NBC Sports Bay Area. ^ "Pablo Sandoval HR gives Giants walk-off win in season finale". ESPN.com. October 1, 2017. ^ Baggarly, Andrew (October 1, 2017). "Giants win season finale on Sandoval's walk-off home run". Bay Area News Group. ^ Gackle, Paul (July 29, 2018). "Bochy passes Stengel on wins list from Cooperstown, but Giants face more health issues". Bay Area News Group. The Sacramento Bee. ^ "Giants finish 5-21 September for another losing season". The Associated Press. USA Today. October 1, 2018. ^ Schulman, Henry (February 22, 2015). "Bruce Bochy returns to Giants' camp 'good to go'". San Francisco Chronicle. ^ Ballard, Chris (December 15, 2014). "For Giants, success starts with Bruce Bochy, 2014 Coach of the Year". Sports Illustrated. ^ Baggarly, Andrew (June 8, 2010). "Giants draft Bruce Bochy's son, plus other pregame notes". San Jose Mercury News. ^ Hood, Ryan (September 14, 2014). "Bochy gives son MLB debut in tough spot". MLB.com. ^ a b Kepner, Tyler (29 March 2015). "Bruce Bochy Won't Let Success Go to His Head" (The New York Times Magazine). The New York Times. Retrieved 29 March 2015. ^ Noble, Marty (August 24, 2013). "Bobblehead a fitting tribute for Mets' Horwitz". MLB.com. ^ Mifflin, Lawrie; Katz, Michael (September 2, 1982). "SCOUTING; Bruce Bochy's Big Problem". The New York Times. ^ Baggarly, Andrew (February 22, 2015). "Bruce Bochy upon returning to Giants: "I couldn't feel better."". San Jose Mercury News. ^ Bloom, Barry (July 14, 2017). "Bochy remains driven as ever for Giants". MLB.com. ^ Baggarly, Andrew (August 9, 2016). "Bochy returns, Giants shut out in loss to Marlins". ^ Macklin, Oliver. "Bruce Bochy undergoes minor heart procedure". MLB. Retrieved April 18, 2017. ^ Baggarly, Andrew (October 13, 2017). "Giants manager Bruce Bochy resting after heart procedure". Bay Area News Group. ^ Bruce Bochy on Resilience, 2011 National Youth Sports Awards Sponsored by Deloitte. Positive Coaching Alliance. May 19, 2011. ^ "Clubhouse Construction Under Way at Bruce Bochy Baseball Field". Eastern Florida State College. October 22, 2012. ^ Lund, Ryan (June 3, 2015). "Giants manager Bochy staying active post-surgery". San Francisco Chronicle. Wikimedia Commons has media related to Bruce Bochy.